Sears Holdings' (NASDAQOTH: SHLDQ) fate has been in limbo for the past several months, ever since the company filed for bankruptcy protection last October. However, last week, ESL Investments -- the hedge fund run by Sears Holdings Chairman Eddie Lampert -- won a bankruptcy auction for the remnants of the iconic retailer. Pending approval of the bankruptcy court, Lampert plans to keep at least 400 stores operating, down from about 1,000 a year ago. There's a good chance that even this scaled-down business won't be able to stay afloat for very long. Nevertheless, the short-term survival of the Sears and Kmart chains is very good news for Pennsylvania Real Estate Investment Trust (NYSE: PEI) and Seritage Growth Properties (NYSE: SRG). Over the past several years, PREIT -- a mall owner with operations focused primarily in the Northeast -- has steadily reduced its exposure to Sears. Through a combination of selling less-desirable properties and proactively replacing struggling anchors with better-performing tenants, it has whittled down the number of Sears stores in its portfolio to six. As recently as 2012, PREIT had more than two dozen Sears stores spread across its malls. This anchor-redevelopment activity has been expensive. For example, during 2018, PREIT was working on more than half a dozen anchor-replacement projects, while also redeveloping its Center City Philadelphia property, now called Fashion District Philadelphia. As a result, the company's capital spending has surged in recent years. PREIT has invested heavily to replace struggling anchor stores with new tenants. Image source: PREIT. However, that could be about to change. All of PREIT's major capital projects are scheduled for completion by the end of 2019. That puts the REIT on track for a surge in rental income and a decline in capex in 2020. PREIT expected that it would need to spend about $60 million to replace its remaining Sears stores in the event of a liquidation. 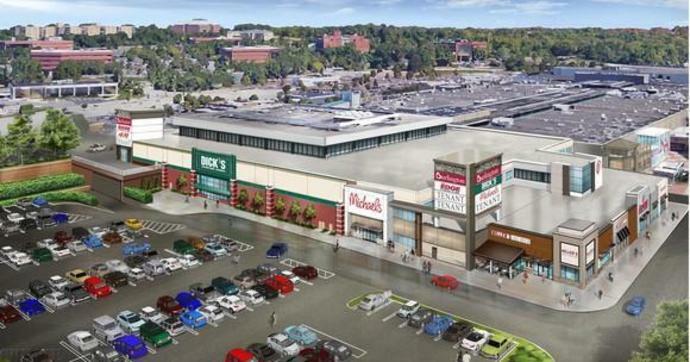 Instead, it will only need to redevelop one or two Sears stores in the immediate future. The proceeds from selling excess land should fully pay for these projects and a few additional anchor replacements, if necessary. In short, the financial pressures that caused PREIT stock to lose about half of its value in 2018 are set to ease significantly, even if Sears only survives for a couple more years. That makes the stock's monster 12% yield look safe for the foreseeable future. If Sears Holdings' short-term survival is good news for PREIT, it's even better news for Seritage Growth Properties. Seritage, which was spun off from the retail giant in 2015, still gets a substantial (albeit declining) chunk of its rental income from Sears Holdings. From day one, Seritage's business model has been premised on replacing Sears and Kmart stores with higher-paying tenants. However, Sears and Kmart have been downsizing so quickly that Seritage has struggled to release space as fast as Sears Holdings has been closing stores. A liquidation would have left Seritage Growth Properties with a lot of vacant space in the short term. Seritage's strategy involves redeveloping Sears and Kmart stores. Image source: Seritage Growth Properties. As of the time of Sears Holdings' bankruptcy filing, the remaining Sears and Kmart stores in Seritage's portfolio were generating $49 million of rent and $35 million of property-related expense reimbursements annually. By contrast, through the first three quarters of 2018, Sears Holdings' total annualized revenue contribution to Seritage was $145 million. This indicates that Seritage's income from Sears Holdings is set to plummet this year. Yet there's a big difference between $84 million and zero. As of Sept. 30, Seritage had signed leases that will generate $75 million of annual rent (plus a smaller amount of expense reimbursements) once those tenants open. Most of these new tenants will begin paying rent by the end of 2019. In other words, by this time next year, the new tenants will have more than replaced the rental income Seritage has lost from Sears Holdings closing stores. In the long run, Seritage will still probably need to replace all of the Sears and Kmart stores in its portfolio. But if Sears Holdings can stagger on for a little while longer, Seritage won't have to redevelop all of its properties at once. Many retail REITs have significant exposure to Sears Holdings. But REITs with strong balance sheets and better properties -- such as Simon Property Group -- have been rooting for Sears to fail. They have ample capital to redevelop their properties and know that they could find new tenants that would drive more traffic and pay higher rents. By contrast, weaker mall REITs like CBL & Associates face severe headwinds even without the impact of a Sears liquidation. Too many of their malls are suffering from plunging traffic, which makes bankruptcy a serious risk whenever the next recession hits. Seritage and PREIT occupy a middle ground. They have plenty of high-quality properties, but not enough capital to redevelop all of their Sears and Kmart stores at once. That gives them the most to gain from Sears Holdings staying in business for a while longer. Adam Levine-Weinberg owns shares of Pennsylvania REIT and Seritage Growth Properties (Class A). The Motley Fool has no position in any of the stocks mentioned. The Motley Fool has a disclosure policy.